The star of Peter Jackson's Lord of the Rings prequel had never read the source material until he scored the contract. Watching the old Rankin/Bass animated film of The Hobbit when I was a kid prompted me to go out and read the book. I devoured it and The Lord of the Rings soon after, followed by The Silmarillion and all things Tolkien by the time I was 8 years old. That's why it's inconceivable for me to hear that Martin Freeman, in addition to being an Englishman like Tolkien but also everyone's unanimous choice to play Bilbo Baggins, admits to never having read it growing up. At least Freeman had the wherewithal to say in an interview with Spanish newspaper El Pais that he has done so since he learned of his casting, and that he enjoyed it. "I wasn't a fan of Tolkien before, I am now," Freeman said. Good man, doing your homework. Despite that, I do think that Freeman is a great choice to play the adventurous hobbit, but there was a worry that Freeman wouldn't be able to film The Hobbit in New Zealand due to commitments to the BBC series Sherlock. That has all been worked out, apparently. "I know my work plan," Freeman said. "I start in January, then I'll have a break in the summer so I can shoot the second season of Sherlock, the BBC show where I portray Watson, and then I'll be back in New Zealand in September in order to finish the movie by the end of the year." Freeman is more concerned with appearing in a strongly written film than becoming a big movie star. "[The story is] the most important thing for me. My priority has always been to find a great script," Freeman said before backtracking a bit. "It's true, there isn't a final script for The Hobbit yet. That's why Peter can't tell me much about how Bilbo is going to be. In spite of that, I trust him completely. He's obviously going to be younger than the Bilbo portrayed by Ian Holm in the Lord of the Rings." The biggest difference for Freeman in playing Bilbo is that he finally gets to play a character that takes some initiative. "I love the fact that the majority of the characters I've portrayed in the past always react to something, Bilbo, on the contrary, is an active character. He creates his own adventure." Freeman's gotten the chance to play around with some of the prosthetics that he will have to wear. "A couple of weeks ago, I tried Bilbo's hairy feet for the first time, and also the ears, although mine are big enough already, he said. "Moreover, they made molds out of those parts of my body since I'm going to be using prosthetics for many months." How does he think the role will change his career? "Well, my career has always been step-by-step, always in the search of good scripts: Love Actually, The Hitchhiker Guide to the Galaxy, TV shows like The Office or Sherlock," he said. "I look for honesty in every work I do. I never wanted to have a bigger pool in my yard." 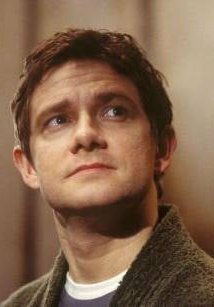 So wait, when The Hobbit comes out, Freeman will have played Arthur Dent from Hitchhiker's Guide, Watson, and Bilbo Baggins. I mean that's like a nerd trifecta. What's next? He plays Doctor Who, Indiana Jones, Flash Gordon, Rick Deckard, and Khan Noonien Singh over the next ten years? Sheesh, save some roles for the other actors would you?